How well is Argo able to observe the global ocean? A key objective of Argo is to observe ocean signals related to climate change. This includes regional and global changes in ocean temperature and heat content, salinity and freshwater content, the steric height of the sea surface in relation to total sea level, and large-scale ocean circulation. The global Argo dataset is beginning to observe global change signals. Seasonal and interannual variability dominate the upper ~600 m of the ocean, but temperature anomalies down to 1900 m show a consistent warming trend. There is now a 10+ year time series of good global coverage, but analyses of decadal changes presently focus on comparison of Argo to sparse and sometimes inaccurate historical data. Indeed, Argo floats only go down to 2000 meters now and the deeper half of the volume of the ocean is not being observed by Argo. Work is being down to develop Deep Argo floats that can measure all the way down to 6000 meters to help answer questions about deep ocean warming. Argo's greatest contributions to observing the global oceans are still in the future, but its global span is clearly transforming the capability to observe climate-related changes. Estimates of the heat content anomaly for 60°S - 20°S (black), 20°S - 20° N (red) and 20°N - 60°N (blue), and a global estimate (purple). Regression lines (dashed) are shown in the inset. Global coverage is essential, but for global change applications, Argo data must also have high accuracy and minimal systematic errors. Therefore, a high priority for Argo is to continue work aimed at identifying and correcting pressure measurement errors, especially those with systematic impacts. High quality shipboard CTD transects are critical for assessing data quality in nearby profiling floats. 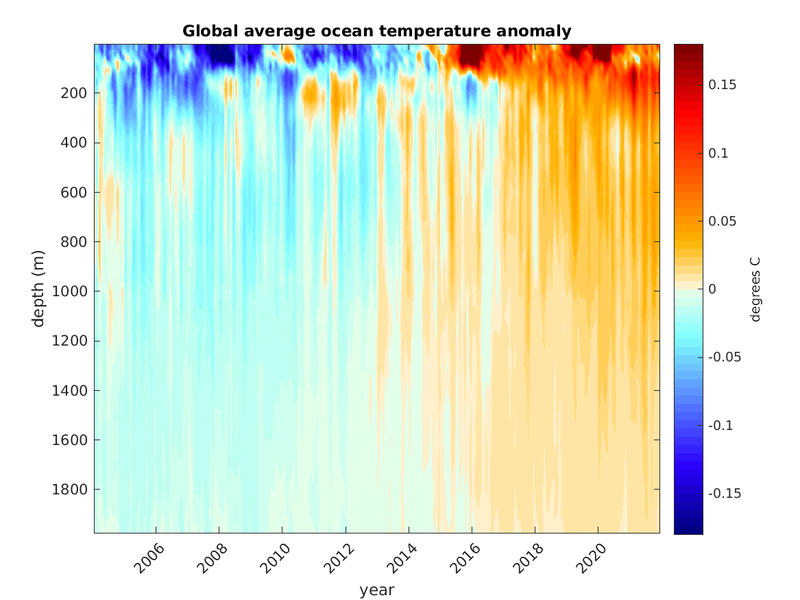 Each month, the figure below showing the global average ocean temperature anomaly in the upper 1900 meters based on the gridded RG Argo Climatology (http://sio-argo.ucsd.edu/RG_Climatology.html) is updated. Levitus et al 2012, Domingues et al (2008) and Levitus et al (2009) previously, have estimated the multi-decadal upper ocean heat content using best-known corrections to systematic errors in the fall rate of expendable bathythermographs (Wijffels et al, 2008). For the upper 700m, the increase in heat content was 24 x 1022 J (±2.S.E.) since 1955. This is consistent with the comparison by Roemmich and Gilson (2009) of Argo data with the global temperature time-series of Levitus et al (2005), finding a warming of the 0 - 2000 m ocean by 0.06°C since the (pre-XBT) early 1960's. Each year, the Bulletin of the American Meteorological Society puts out a publication on the state of the cliamte. Now included is an update on ocean heat content in the upper ocean. There are several different calculations from five different sources as can be seen below. Fig. 3.6. (a) Annual average global integrals of in situ estimates of upper (0–700 m) OHCA (ZJ; 1 ZJ = 1021 J) for 1993–2017 with standard errors of the mean. The MRI/JMA estimate is an update of Ishii et al. (2017). The CSIRO/ACE CRC/IMAS-UTAS estimate is an update of Domingues et al. (2008). The PMEL/JPL/JIMAR estimate is an update and refinement of Lyman and Johnson (2014). The NCEI estimate follows Levitus et al. (2012). The Met Office Hadley Centre estimate is computed from gridded monthly temperature anomalies (relative to 1950–2016) following Palmer et al. (2007). The IAP/CAS estimate is described in Cheng et al. (2017). See Johnson et al. (2014) for details on uncertainties, methods, and datasets. For comparison, all estimates have been individually offset (vertically on the plot), first to their individual 2005–17 means (the best sampled time period), and then to their collective 1993 mean. (b) Annual average global integrals of in situ estimates of intermediate (700–2000 m) OHCA for 1993–2017 with standard errors of the mean, and a long-term trend with one standard error uncertainty shown from 1992–2010 for deep and abyssal (z > 2000 m) OHCA following Purkey and Johnson (2010) but updated using all repeat hydrographic section data available from https://cchdo.ucsd.edu/ as of Jan 2018. Among the major societal impacts of climate change is an increase in the global cycle of evaporation and rainfall caused by a warmer ocean surface layer. Changes in the patterns and magnitude of rainfall and storms affect nearly every facet of society, from agriculture and urban water supplies to disease and health, to housing, transportation and insurance impacts of severe weather. While the impacts are local and regional, the causes and patterns are global. Regionally, the ocean becomes fresher or saltier where the balance between evaporation minus rainfall tips in one direction or the other over time. As an integrating measurement made with high accuracy, freshwater content (salinity anomaly over a layer) is the most sensitive yardstick available for observing the global fingerprint of a changing hydrological cycle. A second application of salinity is to diagnose the global volume of ice. Melting of either floating ice or glaciers and ice sheets lowers ocean salinity. Recent analysis of Argo data in relation to the historical record show an increase in salinity in evaporative mid-latitude regions and a freshening at high latitudes and tropical convergence zones. This pattern may imply an increase in the global hydrological cycle by several percent (Johnson et al, 2014, Durack et al, 2012, Helm et al, 2010, Hosoda et al, 2009, Johnson and Lyman, 2008). Fig. 3.7. (a) Map of the 2017 annual surface salinity anomaly (colors, PSS-78) with respect to monthly climatological 1955–2012 salinity fields from WOA13v2 [yearly average (gray contours at 0.5 intervals), PSS-78]. (b) Difference of 2017 and 2016 surface salinity maps (colors, PSS-78 yr−1). White ocean areas are too data-poor (retaining < 80% of a large-scale signal) to map. (c) Map of local linear trends estimated from annual surface salinity anomalies for 2005–17 (colors, PSS-78 yr−1). Areas with statistically insignificant trends are stippled All maps are made using Argo data. Steric sea level provides a great example of Argo's complementary relationship with other observing system elements, particularly the altimeter Jason. Argo provides the capability to understand sea level change by measuring its component due to subsurface temperature and salinity. The steric component is dominant over the mass component in regional sea level variability and on a global basis it accounts for about 1/3 of total sea level increase in the past half century (Domingues et al 2008). Accurate projections of future sea level require an understanding of the causes of sea level change in the modern record. On seasonal and longer time-scales, sea surface height is dominated by changes in subsurface density. Thus, by measuring temperature and salinity as a function of depth, Argo reveals not only how much of sea surface height variability is steric in origin, but also how the steric signal is distributed over depth and between temperature and salinity. Combining sea surface height measurements from the Jason altimeter and Argo's ability to see below the ocean surface, climate related basin-scale signals on interannual and decadal timescales, such as a 15-year spin-up of the South Pacific gyre described by Roemmich et al, 2007 are becoming apparent. On global scales, Argo and Jason, together with satellite gravity measurements, partition global sea level rise into its steric and mass-related components (Ablain et al, 2015, Dieng et al, 2015, Llovel et al, 2014, Leuliette and Willis, 2011, Willis et al, 2008, Cazenave et al, 2009, Leuliette and Miller, 2009, Wunsch et al, 2007). Figure 1: The esimates are observed variations by satellite altimetry (blue), ocean mass contributions based on GRACE data (solid black) and steric sea level based on in situ observations (red). The dashed black curve shows the indirect steric mean sea-level estimate inferred by removing ocean mass contributions from the observed sea-level time series. Seasonal signals have been removed from all curves. Curves are offset for clarity. Shading, where shown, denotes 1-σ uncertainty of the respective estimates. The oceans are not only reservoirs for heat and water in the climate system. They are dynamically active, redistributing heat and water by means of an ocean circulation that responds to changes in wind and thermohaline forcing. Argo presently observes only the interior upper-ocean circulation, so a complete observing system that includes boundary currents and deep measurements is essential for understanding the entire ocean circulation. Some recent papers describing upper-ocean circulation include Roemmich et al's (2007) paper on Argo contributing to estimating changes in gyre-scale circulation, Gille's (2008) paper on the Antarctic Circumpolar Current and McCarthy's (2015) paper on the Atlantic meridional overturning circulation. Ollitrault's creation of the ANDRO Atlas uses Argo trajectory files to calculate 600,000+ deep displacements which can be used to calculate deep velocities. Figure 10: Mean zonal velocity in the layer 950-1150 dbar with a minimum of 30 float days within each 150-km-diameter disk.